Ahoy There Mateys! Thursday, September 19, any buccaneer to enter a participating Krispy Kreme and talk like a pirate gets one FREE Original Glazed® doughnut. To the landlubber who dares to wear full pirate attire goes a bounty of one FREE dozen Original Glazed doughnuts. Offer good on International Talk Like a Pirate Day, September 19th, only. Visit http://KrispyKreme.com/Pirate for more information. 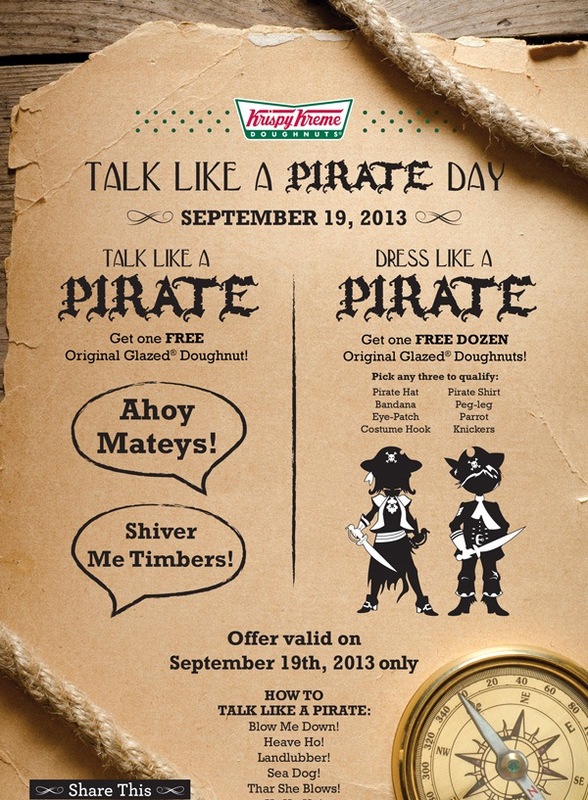 Come in to a participating Krispy Kreme shop and Talk like a pirate for one FREE Original Glazed doughnut. • Come in to a participating Krispy Kreme location in full pirate costume for one FREE dozen Original Glazed doughnuts. Qualifying pirate costumes must include three or more of the following items: NO WEAPONS ALLOWED!